Who needs Botox when you’ve got bone broth? (Ha ha, real food joke.) Homemade bone broth, as many real-foodies know, provides a rich source of collagen, a component that adds luminosity and plumpness to the skin. Both collagen hydrolysate and gelatin comes from cooking the bones, hides and hooves from animals. Dietary sources of quality gelatin have all but disappeared from the modern diet, although past generations widely consumed gelatin-rich broths, soups, headcheese, calves foot jelly, sauces and aspics. These sources of gelatin not only tasted delicious, it boosted the nutritional profile of the meal. Collagen hydrolysate is a dietary supplement. It is essentially gelatin and carries all the benefits of gelatin, however it is processed in a way that it dissolve into hot and cold liquids without gelling and is more quickly absorbed by the body. UPDATE: Previously in this post, I recommended Great Lakes Gelatin and Great Lakes Collagen Hydrolysate. Now, I recommend Vital Proteins Collagen Peptides and Collagen Protein (Gelatin). I switched my recommended brand because I think Vital Proteins is a higher quality product with better packaging. Plus, they offer free shipping on all their orders and I love their customer service. 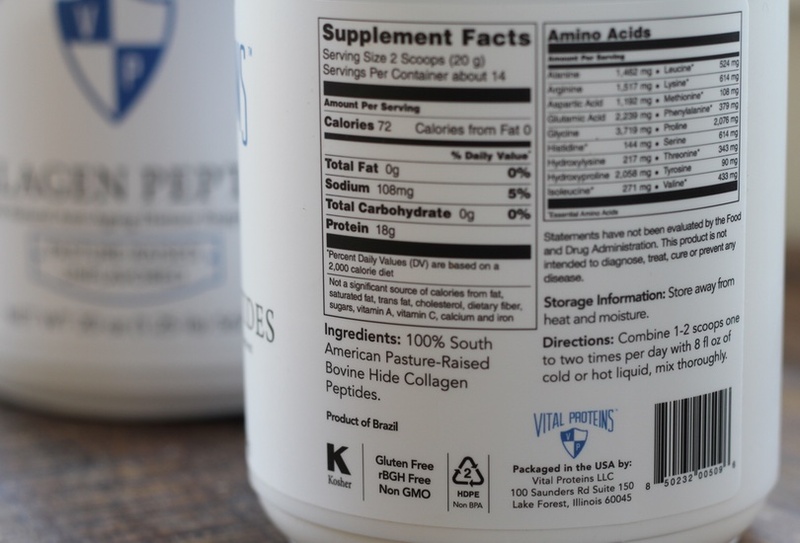 So, just to clarify, collagen hydrolysate is interchangeable with Vital Proteins Collagen Peptides. 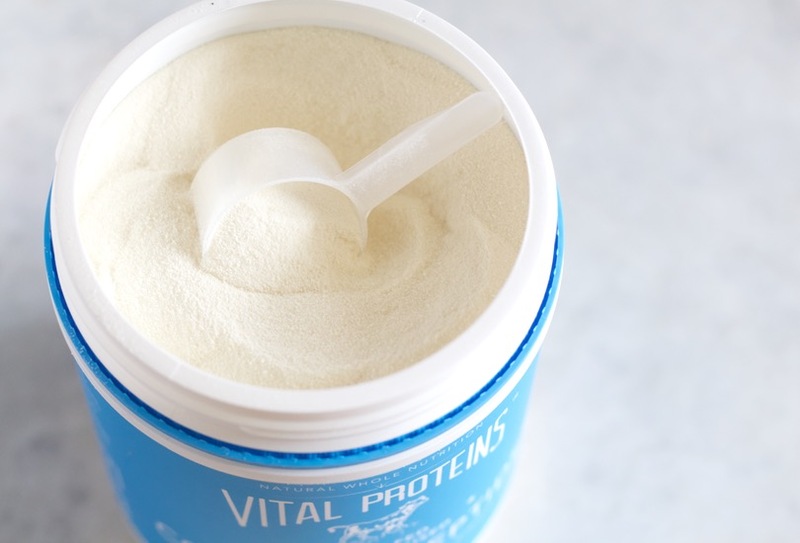 You can purchase Vital Proteins Collagen Peptides here (free shipping on all orders). Collagen hydrolysate and gelatin both start from the same ingredient: collagen from beef (or pork, for the non-kosher gelatin option) hides. As a result, these two products share the same amino acid profiles. The primary difference is that collagen hydrolysate is more easily assimilable due to the hydrolyzing step and it does not gel. On the other hand, gelatin can be used to make jello and puddings. When I use the term “gelatin” and “collagen hydrolysate,” remember that these are basically interchangeable in regards to the health properties. Of the amino acids in collagen hydrolysate and gelatin, 35% is glycine and 21% is proline and hydroproline. Also important, collagen hydrolysate/gelatin completely lacks the amino acid tryptophan. The high percentage of glycine and proline, as well as the lack of tryptophan, help balance the ingestion of large amounts of tryptophan and cysteine present in muscle meats. The equilibrium of amino acids play a large role in metabolic rate, thyroid function and hormone production. 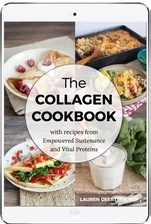 Note: a level tablespoon of collagen hydrolysate provides 7 grams of gelatin. The point here, of course, is that amino acids consumed out of balance are not conducive to health. Does that make tryptophan bad? No. Does is make serotonin bad? Nope. Does it make cortisol bad? No again. The trouble arises when these elements are out of proportions. By helping to balance the tryptophan, gelatin supports healthy thyroid function and reduces the metabolic stress of increased cortisol. Thyroid and metabolism go hand-in-hand, so gelatin may actually increase metabolism by improving thyroid function. Dr. Pottenger, another researcher who offered extremely valuable research in the field of nutrition, praised bone broth because it provides a source of hydrophilic colloids in the form of gelatin. Raw foods tend to be hydrophilic – water-loving – and blend with digestive juices for efficient digestion. Cooking food, however, often creates hydrophobic colloids and can repel digestive juice in the stomach. Because collagen hydrolysate/gelatin remains hydrophilic even when heated, it aids digestion of cooked food. Because poor digestion underlies all hormonal imbalances, improving stomach acidify and nutrient assimilation supports the roots of hormone balance. Ideally, consume a source of gelatin with each meal. This could be a cup of homemade bone broth, some homemade jello bites or a tablespoon of collagen hydrolysate stirred into a smoothie or beverage. Remember, the collagen hydrolysate/collagen peptides do not gel in liquid, while the Vital Proteins collagen protein can be used to make jello and gummies. Balance Hormones with a Raw Carrot a Day! I tried Vital Proteins yesterday for the first time. Two scoops. Once. By evening I was starting to have a migraine and by morning it was severe. I wish I had known beforehand! I was thinking of purchasing the collagen powder, as i have leaky gut. But recently i read that you should not take this if you have candida, i am confused now as how can a product that is said to help heal the gut, actually not be good if you have candida, which is a gut problem ? I am by no means a DR or an expert in healing candida (please consult your DR), but I have been battling candida, leaky gut and food intolerance for several years without finding a doctor willing to listen to me /help with diagnoses. Long story short, I was told that my growing list of health ailments were all brought on by stress and at my worst this included allergic reactions to all foods, shortness of breathe, newly developed heart palpation, excessive weight gain (while maybe keeping down 500 – 1000 calories a day) and early menopause like symptoms (I had just turned 30). I’ve been working at turning my health around for the past 3 years through diet and supplements alone, natural antifungals, digestive aids, vitamins and “The Candida Diet” (great website and resource). I have found that adding high quality bone broth (usually cooked with antifungal veggies and herbs) and gelatin have done a great deal in addition to diet (no sugar, no to low simple carbs and gluten free) & supplements in restoring my gut and reversing my food allergies. Happy to report that my health ailments are nearly gone or very minimal at this point and my immune system is even stronger than before (I rarely catch a cold, suffer from season allergies or sinus issues). Perhaps the warning against gelatin is against the sugar content found in some boxed brands or that it may cause slight digestive upset to some. I wish you great health and strength in your battle against Candida and healing! What do you know about fish and chicken derived collagen and gelatin? I’ve been using salmon skin collagen. I’m wondering if there is any difference for the better or worse. Is collagen ok for histamine issues? I’ve got a histamine intolerance and my symptoms have improved since taking 2 teaspoons of collagen hydrosylate everyday. You will better tolerate foods with a high histamine content or specific foods which trigger a histamine release because you have become sensitive or allergic to. Food sensitivities are often caused by leaky gut syndrom and collagen is very helpful because it allows to heal the gut. i have a intramural uterus fibroid , is it safe i can take this collagen drink..? Me too. Is it safe to drink collagen powder? I’ve been taking 1 tablespoon of gelatin in a cup of coffee twice a day for a month now, and cannot believe how much it has impacted my health. More energy, less aches and pains in a knee I’ve been having problems with for a year since I badly pulled a muscle running, and my skin is much much smoother. I also occasionally make healthy gummy bears or jelly for dessert with it. Would recommend it to anyone. This and a drink made with turmeric, black pepper, honey and soy milk every morning have improved my health by 100 percent. Never felt better! I have been taking collagen 1x day for 3 months and feel great. I would like to give it to my children to support healthy growth/digestion. Is there any studies or daily recommendations you can give? I am 56 years old and I have been in paramenopause for 10 years (still get 1-3 periods a year.) Will taking a collagen peptide powdered supplement make my estrogen level kick back in and resume regular periods. I really want the collagen help for various aging reasons, but also really want to get to menopause and no more periods. Anyone with advise or experience??? Ive been taking 3 Tbsp. Great Lakes collagen powder for about a year, I also notice I have Gained weight .. between 10-15 lbs. I am not working out in fact I’m not getting much daily excercise at all. The places I have HAI ed weight feel firmer and my skin looks improved. I would like to Lose 10 pounds though as I do t feel comfortable with this extra weight even though I’m overal firmer without having gotten this way from working out. I ran out of the powder a few months back and didn’t get a new order for about 3-4 weeks, I felt really tired and did notice around the 3 rd week my face looked less smooth. Or … do I just need to have a regular daily exercise habit even if it’s just walking daily and I’ll drop the weight but still keep the smooth firmed overall body? ?